Our HOA has always kept our St. Augustine lawns mowed to 4" to 4.5" and the grass was always green and full. A new contractor began mowing to 3". Since that change the crabgrass has grown through the St. Augustine, resulting in large brown weed patches allover the lawn. I've been told by a large, national lawn company that grass height for St. Augustine should always be 4" to 4.5". 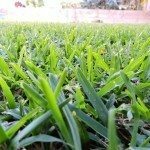 What is the optimum mowing height for an established grass? I would trust the lawn company. This should only be pruned down to about 4 inches. Any lower risks killing off the grass, or leaving it unable to grow properly.